During the period of Curtis L. Hemenway’s directorship, the main work of the Dudley Observatory shifted from observational astronomy to space science. Research centered around the study of cosmic dust in the upper atmosphere and in space. The analysis of micrometeorites to determine their origin formed the bulk of the research performed over the next decades. Micrometeorites are tiny particles less than one-ten-thousandth of a meter in diameter that bombard the earth from space. 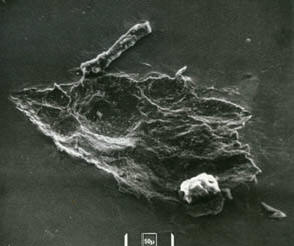 Efforts included collecting micrometeorites with apparatus flown on high altitude aircraft, balloons, and spacecraft, and analyzing the collected materials using such tools as electron microscopes. Dudley’s first major contract was awarded in 1959 by the Air Force Cambridge Research Center. In the early part of 1961, a NASA grant supported balloon-borne sampling devices in the Sesame project. Sounding rockets were used for the same purpose in the Pandora program. 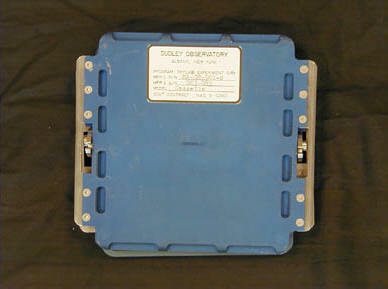 In the 1970’s, Dudley developed experiments and sampling devices that were included in the Apollo, Gemini, Skylab guest experiment programs. Balloons continued to be used in the Magellan project in which circumpolar flights were made from a base in Australia. Contracts and grants to fund research in this general area came from NASA, the National Science Foundation, and the AFCRC. Complementary research areas included the sublimation of ice particles, meteor spectroscopy, particle formation, and ultra high resolution spectroscopy. S-12 micrometeorite collector is the type that flew on the Gemini IX space mission in 1966. It was used by astronaut Eugene Cernan to collect and record the impact of micrometorites (small particles that continually bombard the earth from space). It held stainless steel or lucite sample slides, each about one inch on a side. 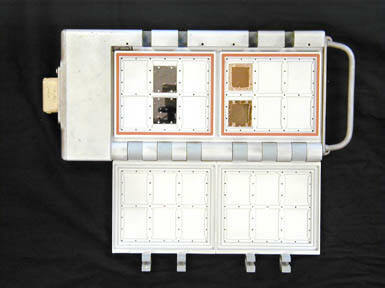 On Gemini IX, these sample slides were scientific experiments, prepared by the Dudley Observatory and other scientific institutions such as the University of Tel Aviv, the Max Planck Institute in Germany, and the U.S. Geological Survey. A few of the slides carried samples of microorganisms in order to test the survivability of these primitive life forms in space. The apparatus was launched into space on the Gemini-Titan II space vehicle on June 3, 1966, and was opened in space for a total of 16 hours and 47 minutes, after which it was recovered by astronaut Cernan and returned to earth. Examination at the Dudley Observatory revealed the presence of “fluffy” particles, as well as holes in the samples believed to have been made by high velocity micrometeorites. Analyzing both the particles and the holes enabled Dudley Observatory scientists to estimate the flux of micrometeorites in space,. Study of samples carried on other slides showed that certain micro-organisms had survived the several hours of space exposure. The S-149 micrometeorite collector is of the type that flew on the U.S. Skylab space mission from June-Sept, 1973. These collectors were exposed to space for a total of more than 100 days, and provided a large body of data concerning cosmic dust in the vicinity of earth. While the collector was opened in space, micrometorites (small particles that continually bombard the earth from space) hit and made holes in a set of copper, silver, and stainless steel strips about two inches long and one inch wide, and left residues of material near the holes. Examination of the metal strips after the flight using electron microscopy revealed holes ranging in size from half a micron (millionth of a meter) to 135 microns in diameter. This made possible estimates of the number of micrometorites of various sizes bombarding the earth.